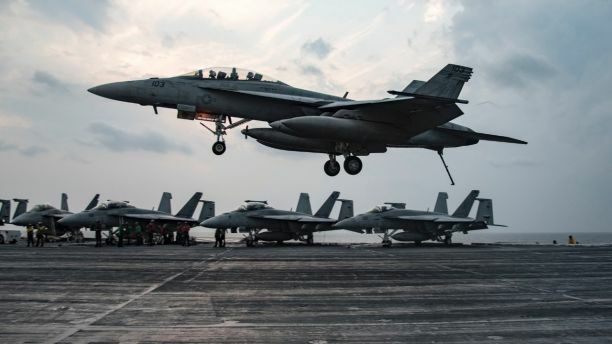 Is the next US aggression on Syria already scheduled? Browse: Home / Is the next US aggression on Syria already scheduled? It appears that we are coming back full circle: the AngloZionists are again, apparently, preparing to use the very same White Helmets (aka “good terrorists”) to execute yet another chemical false flag attack in Syria and again blame the government forces for it. The Russians are, again, warning the world in advance and, just as last time, (almost) nobody gives a damn. And there are even reports that the US is, yet again, considering imposing a (totally illegal) no-fly zone over Syria (I have not heard this once since Hillary’s presidential campaign). And just like last time, it appears that the goal of the US is to save the “good terrorists” from a major governmental victory. It appears that my prediction that each “click” brings us one step closer to the “bang!” is, unfortunately, coming true and while the Empire seems to have given up on the notion of a full-scale reconquest of Syria, the Neocons are clearly pushing for what might turn out to be a major missile strike on Syria. The fact that firing a large number of missiles near/over/at Russian forces might result in Russian counter-attack which, in turn, could lead to a major, possibly nuclear, war does not seem to factor at all in the calculations of the Neocons. True, the Neocons are mostly rather stupid (as in “short-term focused”) people, with a strong sense of superiority and a messianic outlook on our world. However, it baffles me that so few people in the USA and the EU are worried about this. Somehow, a nuclear war has become so unthinkable that many have concluded that it can never happen. The other thing which the Neocons seem to be oblivious to is that the situation on the ground in Syria cannot be changed by means of missile strikes or bombs. For one thing, the last US attack has conclusively shown that US Tomahawks are an easy target for the Syrian (mostly antiquated) air defences. Of course, the US could rely on more AGM-158 JASSM which are much harder to intercept, but no matter what missiles are used, they will not effectively degrade the Syrian military capabilities simply because there are so few lucrative targets for cruise missile strikes in Syria, to begin with. Considering that the US knows full well that no chemical attack will take place (or even could take place, for that matter, since even the USA have declared Syria chemical weapons free in 2013) the White House might decide to blow up a few empty buildings and declare that “the animal Assad” has been punished I suppose. But even if completely unopposed a US missile attack will make no military sense whatsoever. So this begs the question of what would be the point of any attack on Syria? Sadly, the rather evident answer to that is that the upcoming missile strike has less to do with the war in Syria and much more to do with internal US politics. There are a few differences too. The biggest difference is that this time around the Russian naval task force in the eastern Mediterranean is much bigger than last time: 15 ships including two advanced frigates, the Admiral Grigorovich and the Admiral Essen (see a detailed report here: https://www.almasdarnews.com/article/russia-sends-largest-naval-fleet-ever-to-syrian-waters/) and two 636.3-class advanced diesel-attack submarines. That is a lot of anti-ship, anti-air and anti-submarine firepower and, even more crucially, a lot of advanced early warning capabilities. Since the Russian and Syria air defense networks have been integrated by single automated fire system this means that the Syrians will very accurately “see” what is taking place in and around the Syrian airspace (this is especially true with the Russians keeping their A-50U AWACs on 24/7 patrol). What has me most worried are the various reports (such as this one) which say that US Secretary of State Mike Pompeo told Russian Foreign Minister Sergei Lavrov last week that “Moscow would be held responsible” if any chemical attack occurs. If by “Moscow will be responsible” the crazies in Washington DC mean “morally responsible”, then this is just the usual nonsense. But I am afraid that with certified nutcases like Bolton and Pompeo in charge, the US might be considering attacking Russian personnel in Syria (not necessarily at the well-defended Khmeimin or Tartus bases). These guys could easily target various installations or Syrian military units where Russian personnel are known to be deployed and declare that they were not deliberately targeting Russians and that the Russians hit were “clearly involved” with the Syrian chemical weapon forces. The US has already targeted Russian nationals for kidnapping and detention, they might start killing Russian nationals next and then place the responsibility for these deaths on the Kremlin. You don’t think so? Just think “Skripal” and you will see that this notion is not so far fetched. The Russians do have options, by the way. One thing they could do is place 6 (modernized) MiG-31s on quick alert in southern Russia (or, even better, in Iran) and keep a pair of them on combat air patrol over Syria (or over Iran). Combined with the “eyes” of the A-50U, these MiG-31s could provide the Russians with a formidable capability, especially against the US B-1B deployed in Qatar or Diego Garcia. So far, the MiG-31s have not seen action in Syria, but if intercepting a large number of cruise missiles becomes the mission then they would offer a much more flexible and capable force than the very small amount of Su-35 and Su-30 currently based in Khmeimim. But the key to protecting Syria is to beef-up the Syrian air defenses and early warning capabilities, especially with advanced mobile air defense systems, especially many short-to-medium range systems like the Tor-M2 and the Pantsir-S2. Until this goal is achieved, the USA and Russia will remain in a most dangerous “Mexican standoff” in which both parties are engaged in what I call a “nuclear game of chicken” with each party threatening the other side while counting on its own nuclear capability to deter a meaningful counter-attack or retaliation. This is extremely dangerous but there is very little Russia can do to stop the US leaders from coming back to that same strategy over and over again. So far the Russians have shown a truly remarkable level of restraint, but if pushed too far, the next step for them will be to retaliate against the US in a manner which would provide them with what the CIA calls “plausible deniability” (I discussed this option over a year ago in this article). If attacked directly and openly the Russians will, of course, have no other option left than to hit back. And while it is true that the Russian forces in and near Syria are vastly outnumbered by US/NATO/CENTOM forces, the Russians have a massive advantage over the USA in terms of long-range cruise missiles (see Andrei Martyanov’s analysis “Russia’s Stand-Off Capability: The 800 Pound Gorilla in Syria” for a detailed discussion of this topic). None of the above is new, the world has been stuck in this situation for well over a year now and there still appears to be no end in sight. Unfortunately, I can only agree with Ruslan Ostashko: only a massive military defeat or a no less massive economic collapse will stop the folks who “who confuse Austria and Australia” to give up their insane quest for world hegemony by violence.